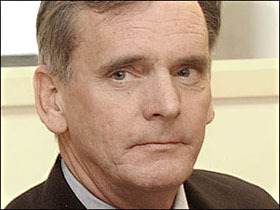 President Obama’s choice for Commerce Secretary, Senator Judd Gregg, withdrew his nomination on Thursday. He said there were “irresolvable conflicts” between him and the administration. Irresolvable conflicts on the stimulus package? That’s crazy. There’s simply no way Gregg didn’t understand Obama’s stimulus priorities when he accepted the job offer. So that leaves the census. Obama has decided to remove it from the Commerce Department and put it directly under the White House, something that’s recently become a right wing cause célèbre. “This isn’t a small or innocent change,” says Rep. Marsha Blackburn (R–Tenn. ), and I suspect we’re going to be hearing a lot more about this soon from Limbaugh and Drudge and the rest of the usual suspects. I hope Obama has a pretty good explanation for doing this. White House officials have announced that the census will technically remain part of the Commerce Department, but that Chief of Staff Rahm Emanuel will oversee it at the White House, raising eyebrows among critics who say he can’t be expected to be neutral in the task. More later as I figure out what’s really going on here.